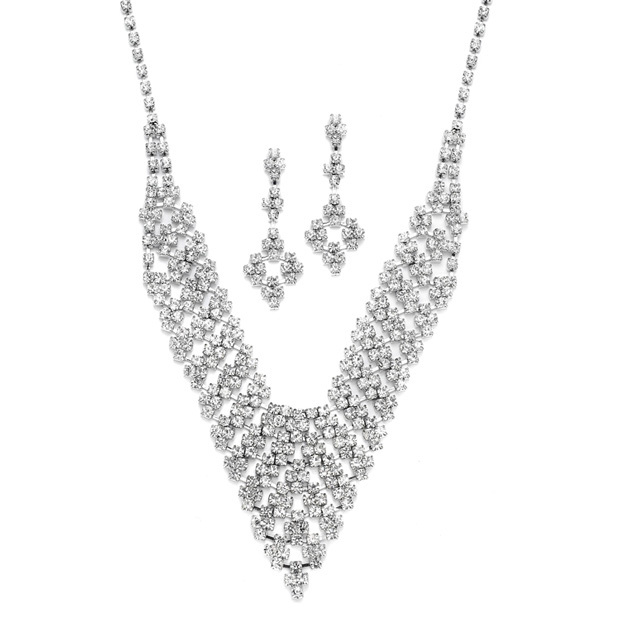 * This vintage rhinestone bib necklace and earrings set has a distinctive chevron design to add timeless elegance to any bridal or prom dress. * Our adjustable necklace measures 15" to 18" and drops 2" at the center. * Earrings are 1 3/4" h.
* Mariell's antique inspired rhinestone necklace and earrings set has a distinctive chevron shaped bib design. * This rhodium plated jewelry will accent any wedding or special event dress with timeless elegance at a great wholesale price.